This week you get two kale salad recipes for the price of one. Although there are dozens of ways to prepare this leafy green veg I was jonesing for a salad a friend ordered on a recent trip to Eataly’s new beer garden, La Bireria and I just had to recreate it. It was simple, yet packed with flavor. 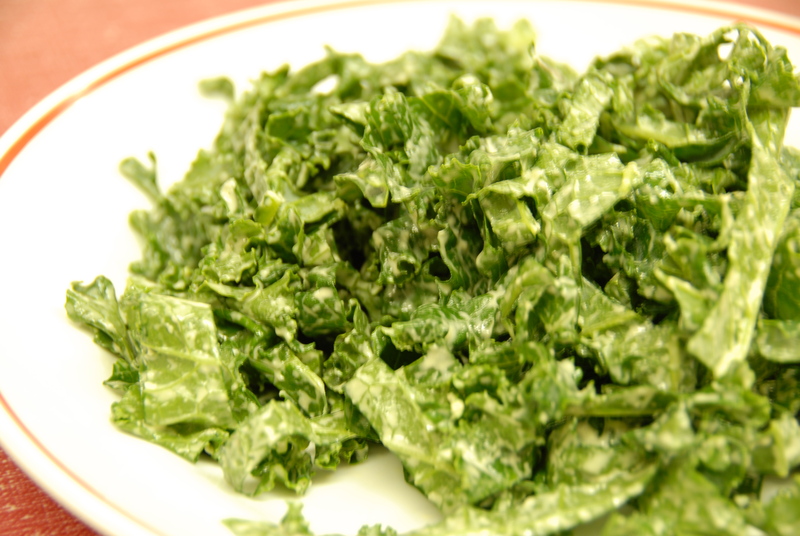 Kale’s sturdy leaves really stand up to the creamy dressing. I urge you to give this a try, especially if you have never made a homemade dressing with anchovies and eggs. Seriously, don’t be scared. You’ll thank me later. First prepare the kale. When I brought it home from the farmers market this weekend I washed it and put it directly into a green bag. (If you don’t have these magical green bags you need to get some. They really stretch the life of your produce.) Cut out the stiff rib in the middle of the leaf and chiffonade (laymen’s terms: cut in thin strips). Place the kale in your serving bowl and sprinkle with salt. This will soften the greens a bit while you prepare the dressing. 1 Spring onion, finely chopped – can replace with shallots, I just happened to see these at the market on Monday! 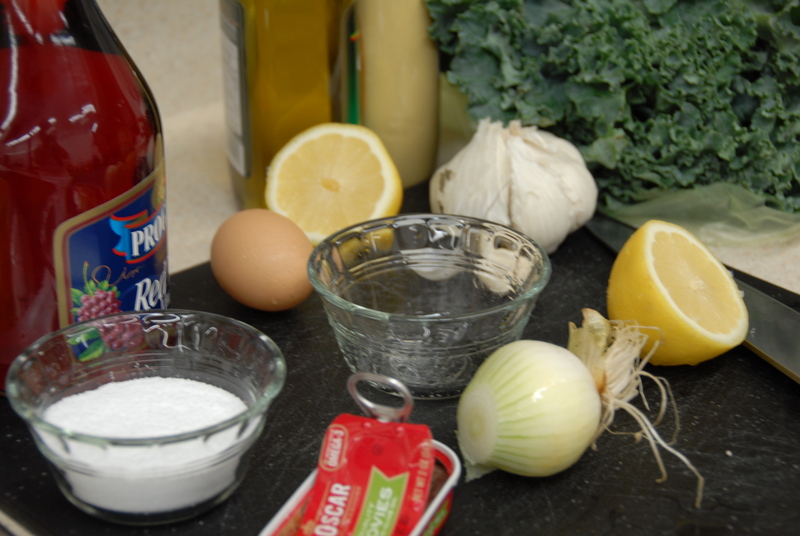 In a blender or food processor – puree the garlic, onions, vinegar, mustard, lemon juice and anchovies until smooth. Add the egg yolk and gently blend. With machine running slowly drizzle in the oil. Taste and season with salt and pepper. 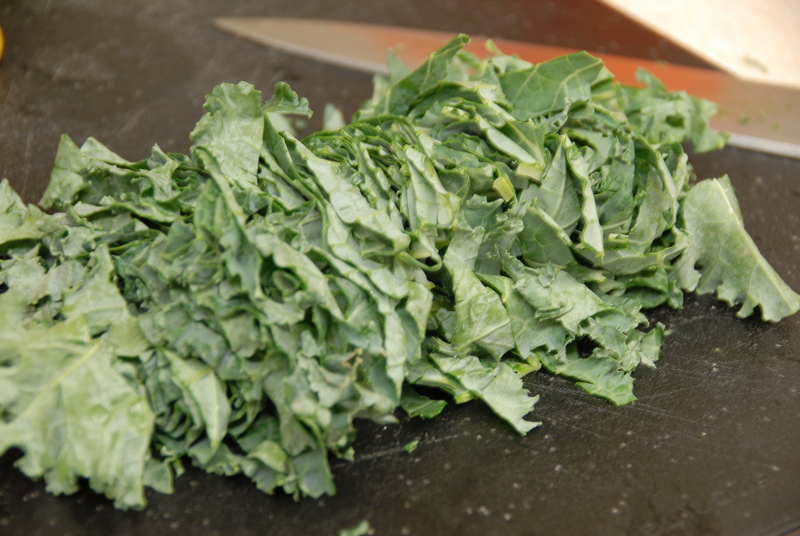 Add a good amount of dressing to the dry, salted kale leaves, toss to coat and enjoy. I had intentions of putting in other ingredients such as cannelini beans and some variety of spicy cured meat, but the salad truly is delicious as is. Note: since there is raw egg yolk in there – refrigerate the dressing and enjoy within 3 days of making. This entry was posted in Kale and tagged anchovy, dressing, egg yolk, kale, salad. Bookmark the permalink.